CHECK RULES BEFORE DEPLOYING THEM Flint prevents engineers from making costly mistakes. It takes just moments for Flint to evaluate a ruleset and spot errors. Your team can have it up and running in minutes. Flint is low-drag, no drama. 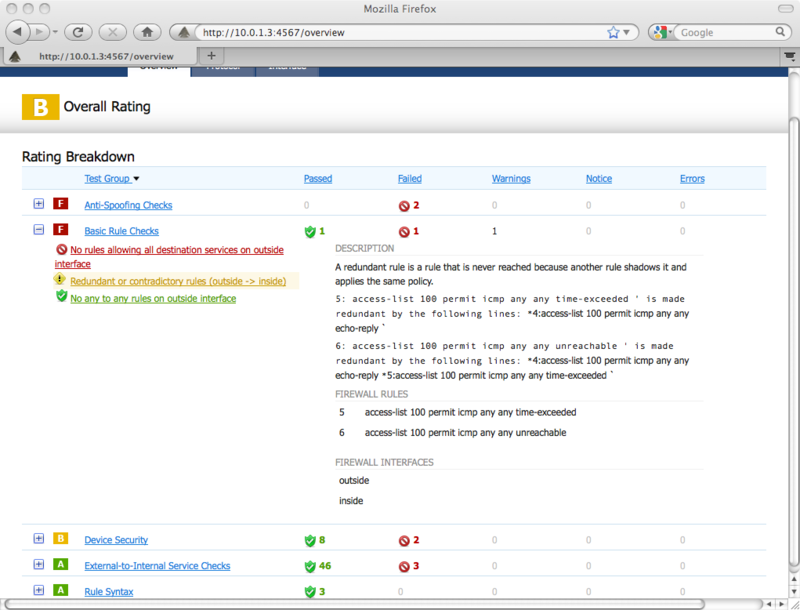 CLEAN UP RUSTY RULESETS Flint does the hard work of scouring firewall rules for useless crud, saving you time and allowing your team to focus on engineering problems that really matter. Flint can spot redundant and contradictory rules, and Flint makes it easier to spot business-level problems. COMPREHEND COMPLEX CONFIGURATIONS Flint doesn’t just check firewalls for problems. It also fully understands the meanings of configuration lines, and breaks them down for you by service or by interface, so you can see at a glance what any given firewall is doing.